"The biggest bang for your bucks!" Bronzino’s Galloper Guns can be hired as a Rare Unit in Dogs of War. armies. Alternatively, they can be hired as a Rare Unit in other Warhammer armies, except Bretonnia. Michael and Alan Perry sculpted the miniatures. The gun may have been sculpted by Norman Swales. Never seen anything like it in all my years. It ain’t right, that’s what. Guns are supposed to stay put, not gallop off whenever you get anywhere near them. And firing while they’re doing it is outrageous! I’m gonna file a complaint, that’s what. It ain’t right. Bronzino’s Gallopers were first employed at the Battle of Pattio. These were, in fact, lightweight cannons removed from their mountings on the galleys of Remas and fixed to specially made carriages. This was done on the instructions of Master Gunner Bronzino who had been hired by Borgio the Besieger, Prince of Miragliano. This innovation contributed in no small measure to the victory and Bronzino proceeded to raise a battery of specially designed guns forged in the very same foundry as that used by Leonardo da Miragliano to cast his colossal brass statues. Bronzino served Borgio well in many more battles but following the Prince’s assassination, and the uncertain state of affairs in Miragliano, Bronzino sought other employment. Since then the battery has turned up in the armies of several notorious mercenary generals, bringing them victory and earning Bronzino enough gold to forge more and improved designs of lightweight cannon. The gunners bring the cannons into action rapidly and fire at close range. This can have a devastating effect on the enemy in an open battle. As soon as the enemy moves near enough to threaten the guns, the gunners hitch them up and gallop off at speed, finding a new position further back. If the battle goes badly and it is necessary to retreat, the precious cannons can be removed from the battlefield without delay. This not only saves the guns for use again, but makes it unlikely that the enemy will capture them. Nor do the guns have to be abandoned in a hasty retreat like other, more cumbersome artillery. Having earned an awesome reputation in Tilea, and incurred the undying hatred of the survivors of many a pike company, Bronzino’s battery was shipped across the ocean to take action against the Lizardmen in a doomed treasure hunting expedition led by the Dwarf pirate, Kugar Halfbeard. Bronzino used the speed of the guns to fight a heroic rearguard action through the jungle to the beach, felling pursuing Saurus warriors in droves as they went. Indeed the guns were still firing from the longboats as they were pushed out to sea, sweeping the beach clear of the enemy until they were safely in open water. The battery subsequently turned up in Araby and took part in the Sultan’s war against the Undead, where the speed and mobility of the guns proved decisive in the open expanses of parched sand. Greatly enriched by his efforts, Bronzino brought his battery back to Tilea where he has been reforging and refitting the guns and considering numerous and very generous offers arriving every day from rival Merchant Princes plotting to make war on each other. Motto: The biggest bang for your bucks! Appearance: Small, lightweight bronze or brass cannons harnessed to light limbers drawn by one horse. One of the gunners rides the horse, the others run beside the gun carrying the ramrods and other equipment. Bronzino is a big man riding his own horse and wearing ornate armor. 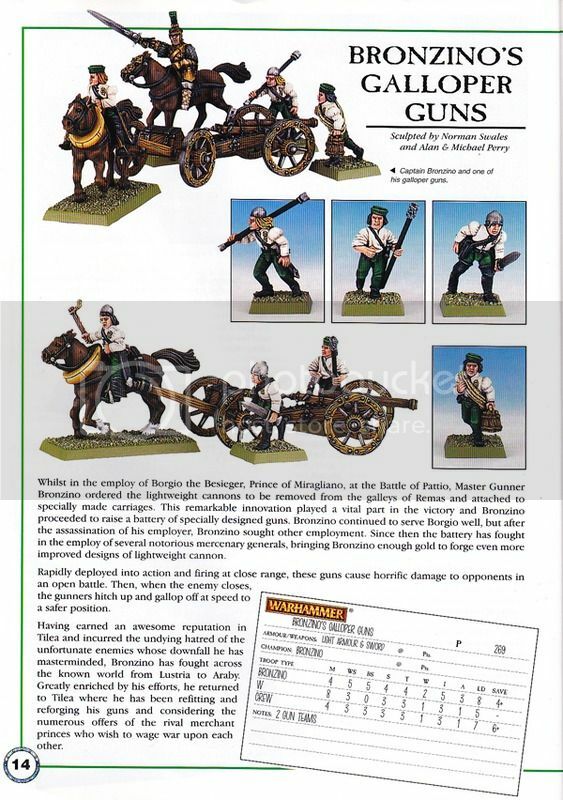 For Hire: Bronzino’s Galloper Guns can be hired as a Rare Unit in Dogs of War armies. Alternatively, they can be hired as a Rare Unit in other Warhammer armies, except Bretonnia. Master Gunner: Bronzino has a wealth of experience as a gunner aboard various Reman galleys and knows all aspects of employing cannons in warfare. To represent this Bronzino may lend his expertise to one gun crew per turn, ensuring that the crew will hit their target. Bronzino will make corrections to the cannon’s elevation etc. Nominate one Galloper Gun team within 6” of Bronzino. You may re-roll the initial roll of the artillery dice for that team. Bronzino may do nothing else that turn, as he is focused on helping the crew. Note, this can allow you to re-roll a misfire. A cannon crew following Bronzino’s instructions is far less likely to improperly load their cannon. Should the cannon actually explode, Bronzino will avoid the explosion and is not removed along with the crew. If you are using Bronzino with an Empire army, the abilities of Master Engineers do not work on the chosen battery of Bronzino. Small Caliber: The maximum range you may guess is 24”. The shots are Strength 5, D3 Wounds, No armor save. Rapid Movement: The galloper gun is harnessed to a warhorse ridden by one of the gunners. This enables the gun to move at a rapid pace like cavalry. The gun may not march move due to its weight and that of the ammunition. Even so, it has a movement allowance of 8” and the other gunners either run to catch up or hitch a ride on the carriage. When you move one of Bronzino’s guns, simply measure the distance and make your move. There is no need to turn or wheel as the galloper guns can turn freely to face any direction they wish. To represent their extraordinary mobility, galloper guns may move and fire. If the galloper gun is charged, the crew may hold or flee. If they flee, the gun is assumed to be limbered up immediately without any movement penalty. If the gun and crew are caught they are destroyed. Note that a galloper gun team flees 3D6”. Note that missile hits on the galloper gun are randomized between the gun and the crew as normal. Roll a D6 for each hit; 1-4 roll to ‘wound’ the galloper gun, 5-6 roll to wound a crewman. The crew fights in hand-to-hand combat as normal, the mounted gunner dismounting to fight. The horse and limber are removed when the gun is destroyed. Deployment: The guns may be deployed as a single battery or the gun teams may be deployed as separate teams, each gun and its crew operating as an independent unit. If so, Bronzino may ride from one team to another and any team he is with can test against his Leadership while he is with it. If the teams are deployed as a single battery, then each gun team must remain within 6” of Bronzino if they wish to test against his Leadership.